The Dell MDS14 Dual Monitor Stand is designed to maximize your viewing comfort and improve your productivity. It comes with multi-adjustment capabilities such as Tilt, swivel, height adjust and horizontally slide the monitors on the stand. It can easily snap on two Dell monitor panels with VESA support and enjoy improved productivity and a clutter-free desktop. Its U-shaped monitor stand also frees up productive desk space in front of the monitors and reduces cable clutter with a cable management slot on the stand riser. 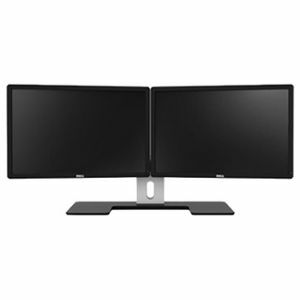 Order Dell MDS14 Dual Monitor Stand today!